Which ones have probes and where are the probes located? In the photo only one has a probe and it right next to it. So they should all be the same right? Numbers should definitely be closer than that. Do you have any other gauges you could test it with? One of them may just be "off". What does the gauge on the left read? Can't see the screen. Nevermind, I zoomed in. It's 53%, correct? Have you tried moving all 3 across the other side of the tank like you have them in the pic? If not, try that and see what they do. Just guessing here....but it seems like your middle gauge could be incorrect. It's not too uncommon (from my limited experience) for them to be just a few numbers off from each other, even when sitting just a few inches apart, but your middle gauge is substantially off. To test a hygrometer's calibration, take a bottle cap or other small shallow container, fill it most of the way with table salt. Add enough water to make a stirrable slurry, no standing water. Mix it up and seal the cap with salt and your hygrometer in a Ziploc bag. 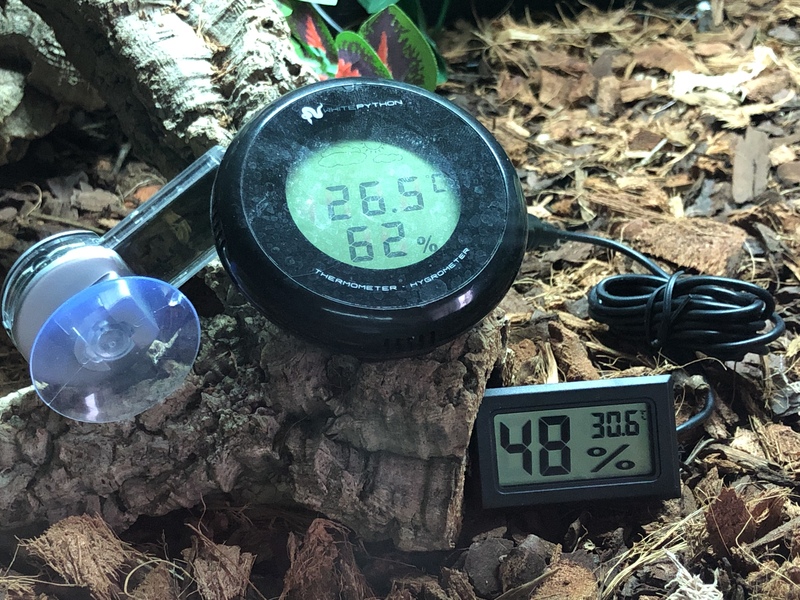 The hygrometer reading should eventually stabilize at exactly 75%. Any variation from this is how far off your hygrometer is. Well I just learned something new.